•In this section you will attribute your network with Strahler order and then symbolize the output. 4.In the Tools panel, expand the Attribute network, tick on "Run network attribution tools" and then press Run Tool to open the attribute network dialog. 5.Tick Strahler and click on OK to execute the tool. RivEX will report its progress in the progress panel. 6.Close RivEX by clicking on the close button in the bottom right of the dialog. 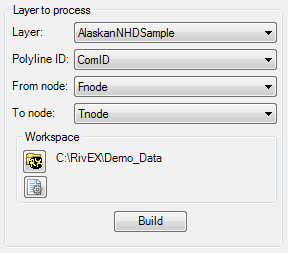 7.Right click on the layer AlaskanNHDSample in the Table of Contents and select Properties to show the layer properties dialog. 8.Select the Symbology tab and complete the dialog as shown below. 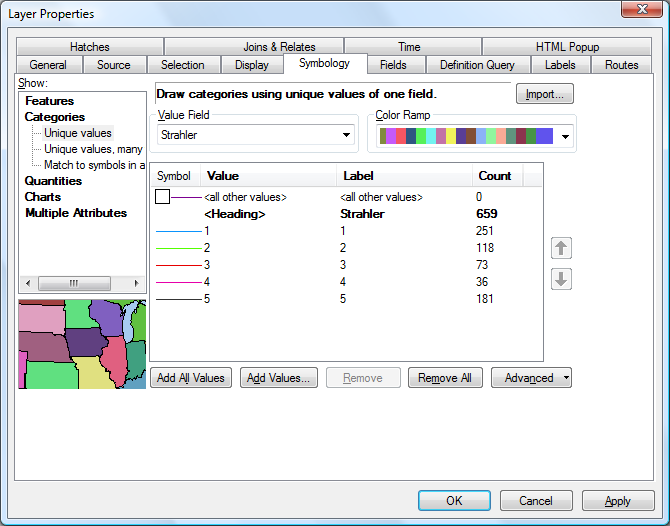 Symbolize your data using the newly created Strahler field with unique values, an example colour scheme is shown below. If you have not used the quality control tools to ensure your network is free of topological errors then review the patterns of colour that are generated, if they are in a logical sequence then you can be confident that the Stream ordering has worked. It is quite possible to provide an error prone network that passes through the stream ordering algorithm without raising an error!